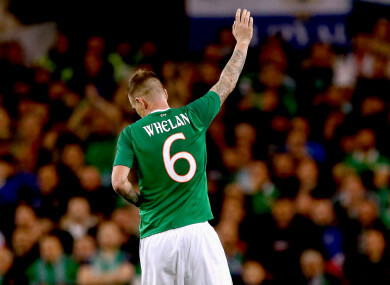 Glenn Whelan waves, eh, see you later to the Aviva crowd against Northern Ireland last November. YOU MAY BE tempted to call it one of the shortest retirements in Irish football, spanning as it did a single game – against Denmark, naturally enough – but as it turns out, it wasn’t a retirement at all. “I rang him and asked him if he had retired, and he said ‘No I haven’t'” said Mick McCarthy of his decision to include Glenn Whelan in his 38-man provisional squad for the Euro 2020 qualifiers against Gibraltar and Georgia. Rather than Whelan making the call himself, it was Martin O’Neill’s, then plotting for a future in which he ultimately played no part. Thus he was given a send-off at the November friendly against Northern Ireland, but it is he, rather than O’Neill, who may be in line for a return to the Aviva at the end of the month. Now he’s spoken to the new manager and is in line for an 86th international cap. Whelan has been playing at Championship level with Aston Villa, and has started six of his side’s last eight games having been a bit-part player under Steve Bruce at the start of the season. “He’s playing very well,” says McCarthy. “He is playing with Conor Hourihane as well so there’s a partnership there, so at least there is some understanding between them there. “I wonder about our squad of midfield players, about whether there is someone who can do a specific job as a sitter, and he certainly can. If Whelan has been recalled, surely McCarthy won’t cut him from the squad when it comes to narrowing it to a 23-man selection? There are some more returning faces. Aiden McGeady, who last played for Ireland in the 5-1 battering against Denmark in 2017, is back following a fine run of form with Sunderland in League One, for whom he has 10 goals and five assists in 27 games this season. James McCarthy is back too, having missed all of 2018 with a broken leg. Although he has returned to fitness, the midfielder is yet to make a senior appearance for Everton this season, which is of concern to the Irish manager. “I’ve spoken to him a couple of times. I hoped he would go on loan at Christmas, but they didn’t let him go for whatever reason. He’s not started a game for a long time. Striker David McGoldrick returns having been frozen out toward the end of O’Neill’s reign, as is goalkeeper Keiren Westwood and defender Stephen Ward. One man who has not returned is Daryl Murphy. The striker retired from Irish duty at the end of 2017, and despite McCarthy’s hopes that he would reverse the decision, he has yet to do so. “He told me he’s retired. He’s at an age at which he likes having that time off when the international breaks come as it will benefit his club career, but I did say that ‘If I need you, and if I call you’, and the final answer was ‘I’ll see’. Email “'I rang him and asked if he had retired, and he said 'No I haven't''”. Feedback on “'I rang him and asked if he had retired, and he said 'No I haven't''”.